Gervase of Chichester (c.1141-c.1210), a monk of Canterbury, was ordained by Thomas Becket, and was one of those that buried Thomas after his martyrdom. 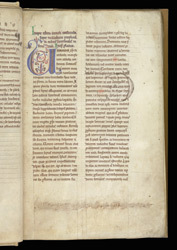 This manuscript of the Commentary on the Old Testament biblical book of Malachi is the only known copy of the text, and is therefore presumably the copy known to have been in the library of Gloucester Cathedral by the end of the Middle Ages. The main text is introduced by an 'arabesque' initial 'U'.